Are you a fan of food? Local businesses? 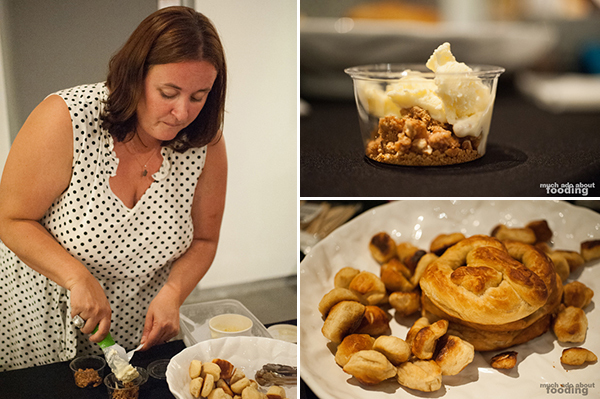 Craftsy goodness in the form of edible genius? 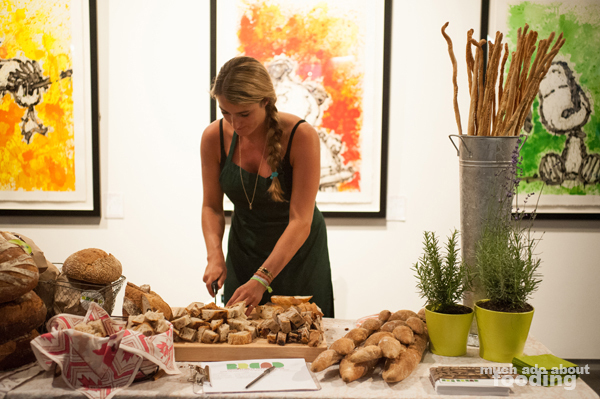 The Patchwork Show: Edible Edition, Southern California's Creative Food Summit, is going to strike Orange County right in the booming food mecca that is the South Coast Collection (SOCO) soon. For two fall days, October 5 from 11am-8pm and October 6 from 11am-5pm, artisans will be gathering to regale visitors through the artisan food movement via demos, food trucks, pop-ups, signings, discussion panels, samplings, beer and wine gardens, DIY workshops, and pallets more. The event will be absolutely free to the public. 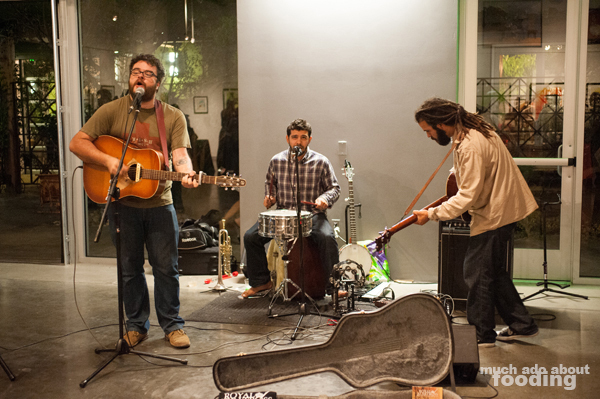 We got a glimpse of what delights are to be in store for future guests at a truncated Patchwork Show the other night - check it out! 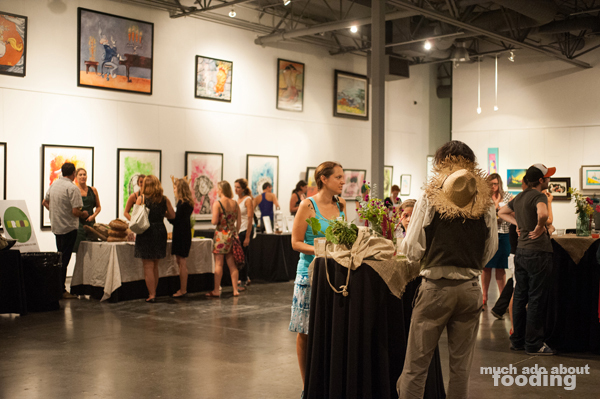 Previewers milled about the Chuck Jones Center for Creativity taking in the art on the walls and the food on the tables. 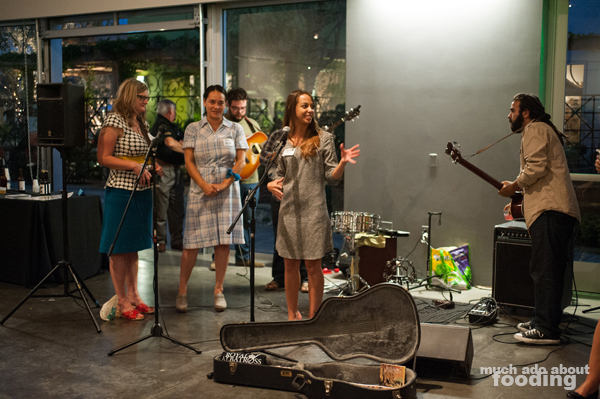 After some preliminary gazing, media guests were addressed by SOCO's Marketing and Special Events Coordinator Anais Tangie and Patchwork Show founders Delilah Snell and Nicole Stevenson. They further explained how the show (a bi-annual modern handmade festival) is meant to showcase up and coming artists and designers but that this special edition was going to focused on food. With 90% of vendors curated for these events being from the immediate region (and less than 1% from anywhere out of state), these festivals are assuredly fun bridges to connect creators to their consumers. What a wonderful way to educate everyone on where our things come from and how to better connect with the community! Our first stops that evening were coincidentally with two vendors of kombucha, an effervescent fermented tea that some supporters are claiming has high health benefits. 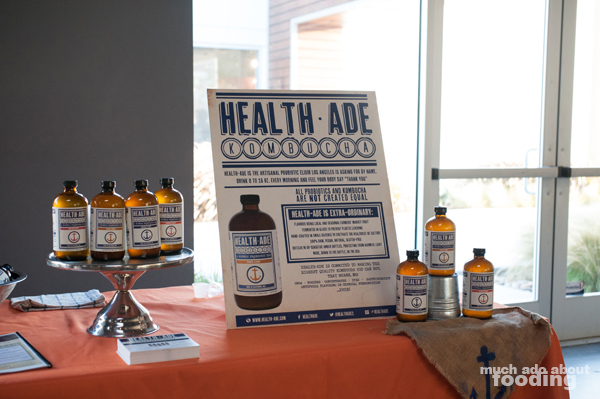 We met with Hannah and Daina of Health-Ade, a kombucha product made the "old-fashioned way." Their products are listed as low in sugar & caffeine, a liver detoxifier, antioxidant-rich, immunity stimulant, and a digestion aid. We were informed that they use only real local farmers' market fruit juice to flavor the drink and distribute in glass containers. 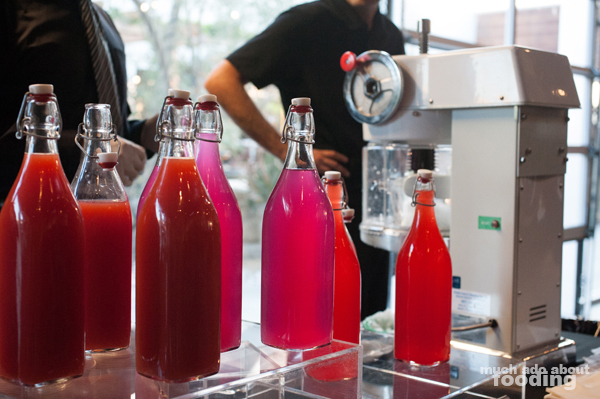 We tried all four flavors of Original, Pink Lady Apple, Cayenne, and Ginger Lemon. They were all pretty neat though the Ginger Lemon was more resounding on our tastebuds - if you're curious about them, they are carried in Los Angeles stores, farmers' markets, and through delivery service! 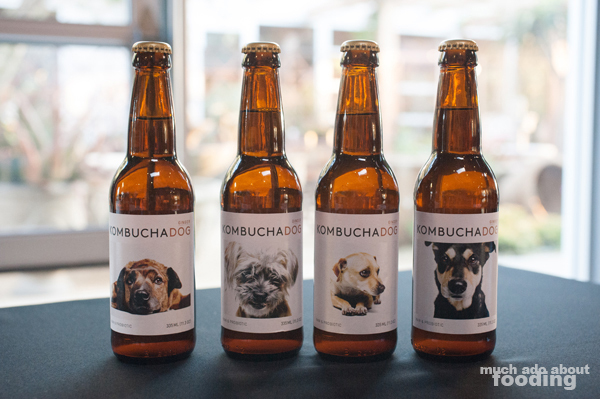 The other kombucha vendor was Michael from KOMBUCHADOG , a hand brewed version bottled in downtown LA. He uses organic tea and raw organic raspberries and ginger for his current flavors with more to come. This product was also focused on being as natural as possible by not using pasteurized fruit syrup, processed sugars, plastic containers, or forced carbonation. We were fans of both the Raspberry and Ginger types and learned that there was actually .7-.8% of alcohol in the drink (which occurs during fermentation), kept as such to stay traditional to creation method and full-strength. If you're wondering about the name of the drink, each bottle has a photograph of an adorable dog. These pictured are all rescue dogs in need of loving homes, and their bios and adoption information can be found on the website. KOMBUCHADOG is carried in 50+ locations currently. 24 Carrots Catering was on site happily placing alcoholic snow cones into guests' hands in a variety of flavors including the more unique dragonfruit and blood orange. 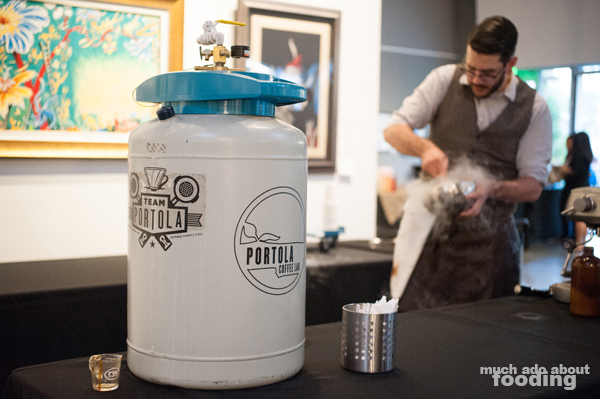 They will be serving those up again and others at the actual show as a sponsor of the fest itself! 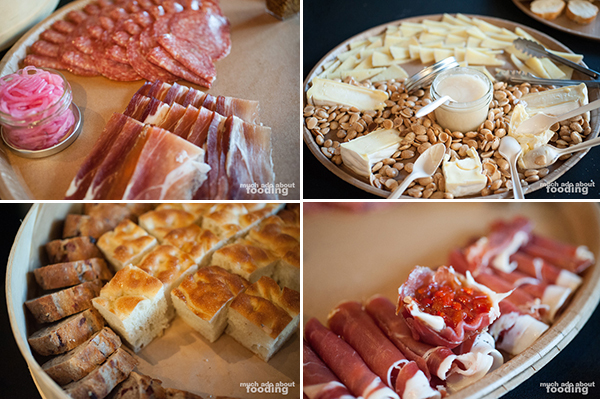 The OC Mix's iconic Cheese Shop also contributed beautiful arrays of charcuterie, cheeses, breads, and accompaniments. 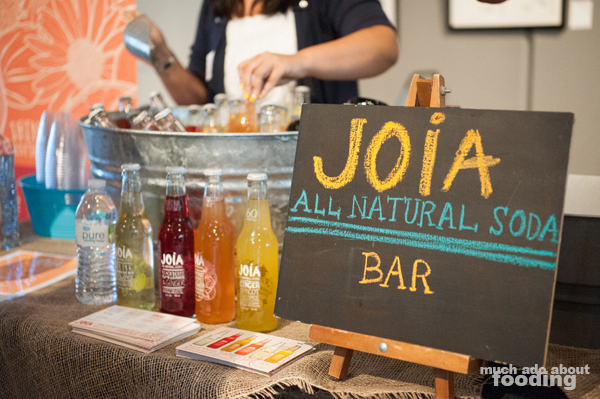 One of the more popular vendors of the night seemed to be Joia All Natural Soda. Was it because their sodas contain nothing artificial, no high fructose corn syrup, and no preservatives? Or was it because they were mixing their juices with vodka? I can't speak on behalf of the other guests there but we personally really enjoyed our juice itself without the additional buzz added. With flavors like lime hibiscus & clove, pineapple coconut & nutmeg, blackberry pomegranate & ginger, grapefruit chamomile & cardamom, ginger apricot & allspice, and orange jasmine & nutmeg, how do you not get a little more curious about how they all taste? 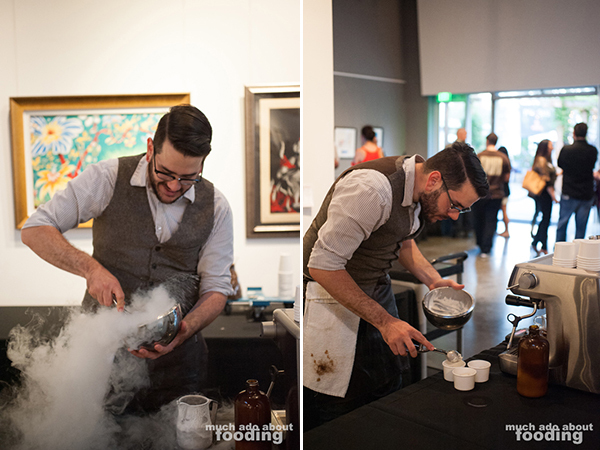 We were, of course, once again enthralled by the talented Truman Severson of Portola Coffee Lab and Theorem who stirred up a science experiment-like affogato for guests. Smooth and creamy, these were a treat to have! Another rich and delicious shooter (or three!) we got came from Almond Milk LA. Seeing as we're milk-intolerant (but not lactose! yes, it's odd! 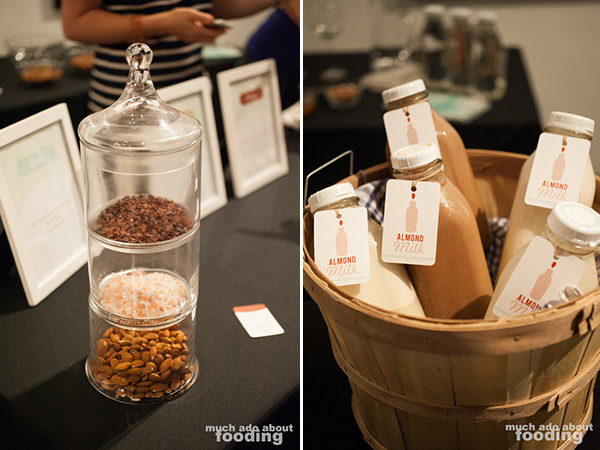 ), almond milk is definitely a drink of interest and this handmade, home delivered variety made from raw, organic, non-GMO, and dairy-soy-gluten free ingredients was tasty. 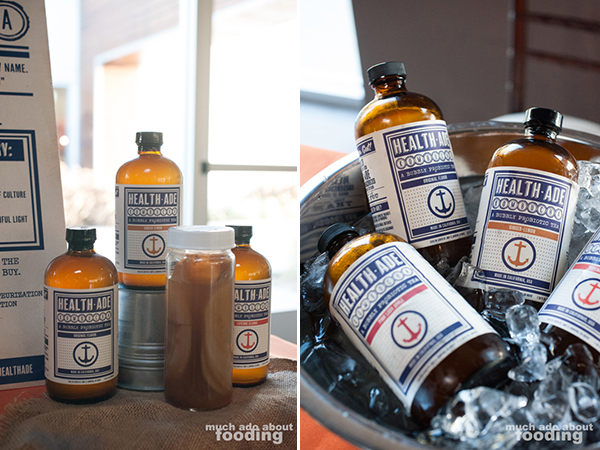 Samples had were of the Pure (raw organic unpasteurized almonds, filtered water, pink Himalayan sea salt), Honey (raw organic unpasteurized almonds, filtered water, pink Himalayan sea salt, raw organic sage honey), and Cacao (raw organic unpasteurized almonds, filtered water, pink Himalayan sea salt, raw organic sage honey, raw cacao powder). 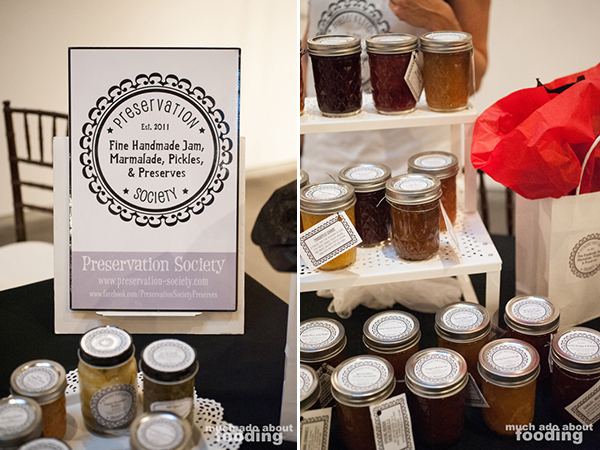 As the consistent fan of food puns and experimentation, the Burbank-based Preservation Society caught my eye for its name. Then they hooked me a little longer with the wide array of jars they had sitting on the table. A company that specifically makes seasonal products based on availability, they are experimentally talented with their jams, marmalades, preserves, pickles, relishes, and "cocktail" mixers. 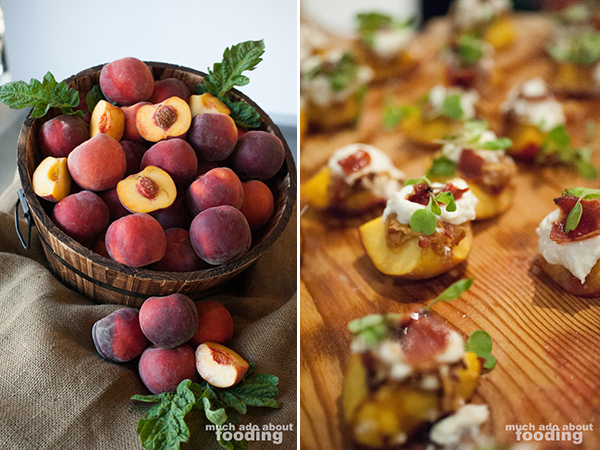 Products of interest were their Pineapple Ginger, Grapefruit-Pluot with Thai Basil, Fig Jam with Sumac and Rosewater, Curry Pumpkin Pickles, and Dill Chard Stem Relish! 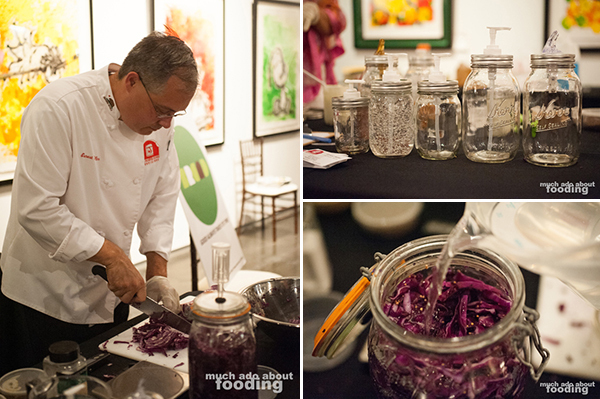 We also met Chef and Master Food Preserver Ernest Miller who was steadily working on a red cabbage sauerkraut throughout the event. 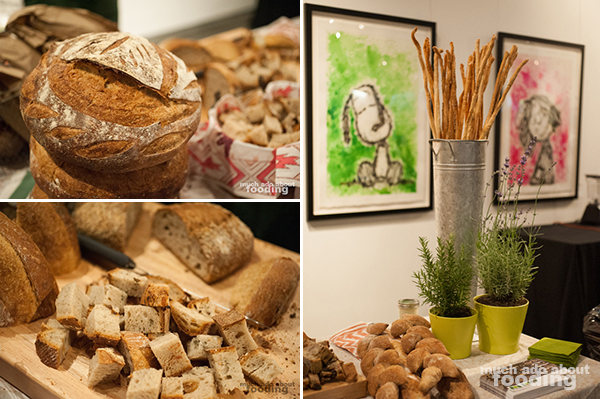 There was also BREAD Artisan Bakery letting guests sample their typically restaurant-only goods. "The YES Bar promise to you - if it's in our bar, it's good for you. And when you eat it, it will be yummy. Like, really yummy." A curious vendor with little to-go baggies of samples caught our eye too and after dancing our way over, we learned more about the YES Bar. These tasty bites are free of gluten, dairy, soy, and corn. Made with varying combinations of nuts, seeds, honey, maple syrup, vanilla bean powder, spices, dried fruit, coconut butter, hemp, chia, etc, these pieces of grain-free, paleo friendly, preservative-free or fillers came with a cute story of how creator Abigail made them in her search for delicious food for her son with food allergies. We had the Macadamia Chocolate Chip & Coffee Cayenne that night and are looking forward to more at the full show in October! Erin of Front Porch Pops came out during the event as well, showcasing some newer items that the popular popsicle pop-up-turned-storefront will be carrying such as pies and soft pretzels. 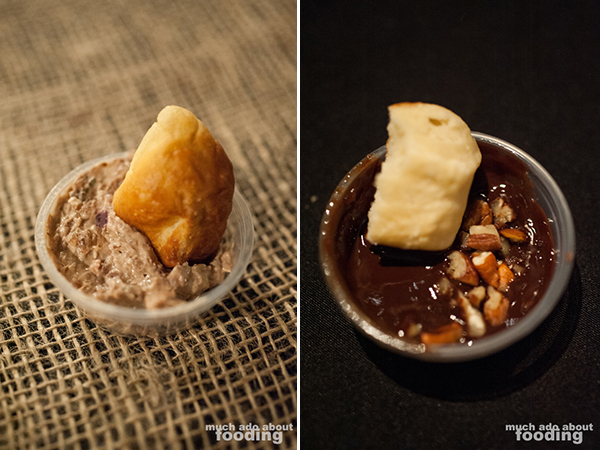 Our savory pretzel came with a much-loved caramelized red onion sauce dip, and the sweeter pretzel bites were dipped into a dark chocolate bourbon sauce. The star of the show at that table however was the Brie ice cream over some crumble. Give us more! 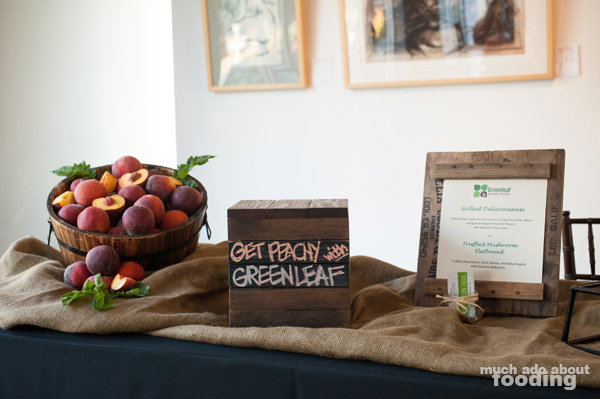 Of course Greenleaf Gourmet Chopshop was there serving fresh and juicy bites of their Grilled Deliciousness. Taco Maria made a brief appearance with their signature guacamole (it has figs! ), chips, and addicting corn. One of the things we had to do coming in was to fill out a name tag with our favorite food on it. Luckily for me, who scribbled "burrata" down, there was some that night! Onotria was just about my favorite vendor for the night with the fresh burrata samples atop passion fruit, and the live "show" of fresh mozzarella being pulled and worked with. 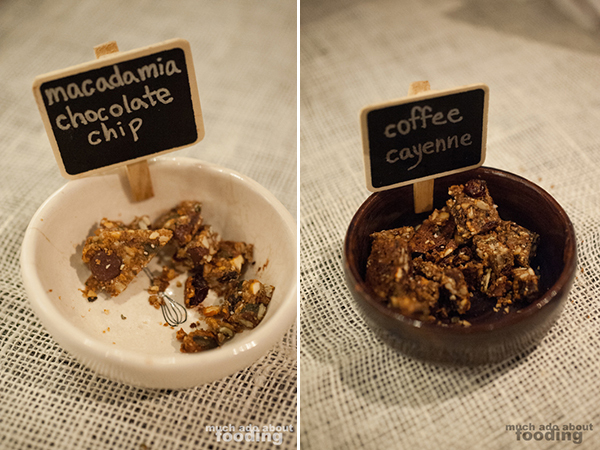 Those little samplings were quite amazing as well. At minimum, five pieces of each were had by me alone but Duc got his favorite food share through his three plates of Taco Maria corn. 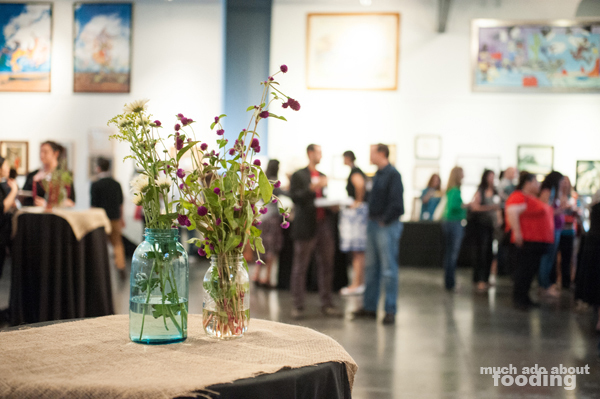 What a fun night and great sneak peek at what wonders are in store for October 5th and 6th! Our thanks to those who invited us and to the fun band Royal Albatross for kicking us all into a lively mood as we walked around. 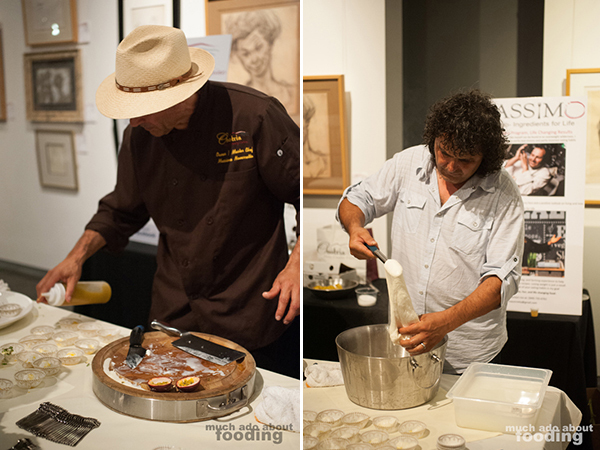 In addition to all of the food itself, the Patchwork Show: Edible Edition will feature guests such as Evan Kleiman, Aida Mollenkamp, Russ Parsons, Gustavo Arellano, Bill Esparza, Chris (CJ) Jacobsen, Dean Kim, Ernest Miller, Laura Avery, and others. Panels will include Policy on your Plate, The New American Dairy Movement, Food Communities, Happenings and the Underground Movement, Gentrification of Mexican Booze, Food Writing and Trends. Demos will include Surfas Stage, Portola/Theorem Stage, ceviche making, mead making 101, burrata pulling, DIY workshops (mustard making, herb bouquets, bitters, sugar coloring,etc), natural watercolors from food, and beauty products from food. Discussions will also include Whole Foods "Local Series", Regional Health Department Forum, and Cottage Law. Excited yet? 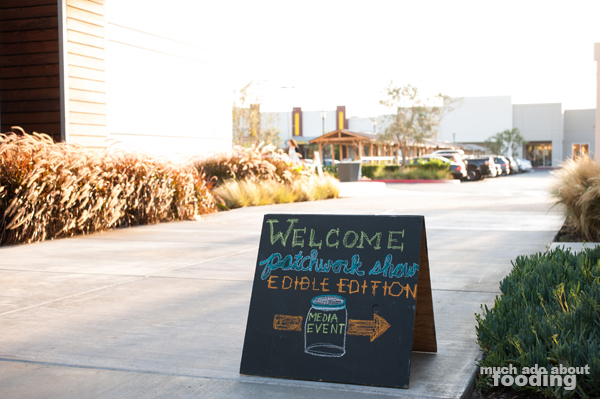 Mark October 5th and 6th on your calendars for convening at 3303 Hyland Ave, Costa Mesa, CA 92626 for the amazing upcoming Patchwork Show: Edible Edition. Make sure to share on social media too through tags #patchworkshow and #edible!